Easter Island Statue Project Official Website : Cristián Arévalo P.
Cristián Arévalo Pakarati, EISP Co-director, in Rano Raraku quarry, 2006. Photo: H. Debey © JVT. 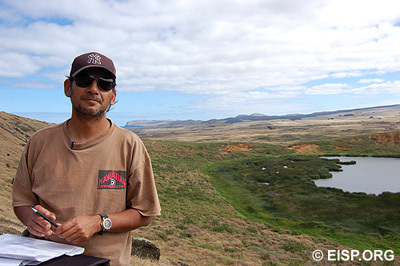 Cristián Arévalo Pakarati, EISP Co-director, is a native Rapa Nui professional artist and illustrator; surveyor; EISP project participant 1989-2000; project co-Director, 2000-present; co-owner, with Jo Anne Van Tilburg, of Galería Mana, Hanga Roa, Rapa Nui, Chile.